Having witness BTS’ popularity at The Red Bullet in Singapore Fansign and Hi-5 Session on Friday, it was no surprise when their concert venue was filled with eager fans Saturday evening, waiting to catch the group at their first ever concert in Singapore. Right from the start, the atmosphere was filled with excitement and when the introduction video was played after the lights were dimmed, non-stop screams immediately filled the venue. Starting off with “N.O”, BTS displayed their charms, showcasing their dance choreographies in sync before continuing with “We Are Bulletproof Pt.2”. BTS did a short self-introduction before leader Rap Monster, on behalf of the group, apologized for the delay (as the concert started half an hour later than the scheduled time). This being BTS’ first concert in Singapore, Rap Monster added that he wanted nothing more than A.R.M.Ys (an affectionate term for fans of BTS) to enjoy the night and have fun. The group continued with “We On” and “Hip-Hop Lover” and promptly took off their jackets after complaining that it was too warm in Singapore due to the fans’ passion. As the concert proceeded, Rap Monster mentioned that “BTS always showcase strong performances on stage, but how are our ballads? Is it good too?”, after performing to a soothing “Let Me Know”. With that, the group continued with “Rain”, a song totally befitting of Singapore’s current weather. Moving on to “Blanket Kick”, where the performance come complete with a bed and a sofa, fans were indeed treated to another side of BTS – a side that is full of cute antics that will definitely make anyone squeal. Imagine along the lines of kissy faces, hugs, flower poses and you are somewhere there. During “Just One Day”, a pleasant fan support event (a pretty pink banner with 너와 하루만 있기를 바래 바래 written on it) took the boys by surprise. Rap Monster acknowledged it and even sang that line again when the lights were up again. He even asked the members if they saw it and commented that it was a really sweet gesture by the fans. J-Hope suggested that the group play a game of ‘Scissors, Paper, Stone’ and the losers will have to do aegyo as a forfeit. V, the group’s resident cutie, casually demonstrated a few poses, much to the horror of the other members as they wanted to uphold their ‘manly image’. Jin and Jungkook lost during the game and were forced to showcase their version of ‘manly aegyo’ during the song “Look Here”. Both Jin and Jongkook were so embarrassed after the act, they were covering their faces and hiding behind the other members. The extended version of “Outro: Propose” was possibly something unexpected as it displayed the group’s vocal charms. Sitting on high stools, Jin, V, Jungkook and Jimin showed what they are capable off, serenading the crowd with nothing but their soulful rendition of the song. Another video was shown, where BTS were bad boys, playing truant and heading to class late, intimidating the teacher and looking anything but remorseful. The change in the atmosphere was apt as instead of the Goody-Two Shoes model student image that was shown for the first half of the concert, the change of clothes (out of the uniform) expressed the start of another phase – the start of something new – as they sang “No More Dream”, the group’s debut track. To BTS, it had been an eventful year and a half since debut and they were nothing but grateful for all the windows opened for them. Rap Monster mentioned that the group will continue to work hard to repay the love received from their fans. No better way to express their feeling than with “So 4 More”. After taking the stage with yet another impressive performance, “Tomorrow”, BTS tried something interactive with “Miss Right”, where they invited A.R.M.Ys to sing along to the chorus. When the song started proper, banners with ’방탄아, 바로너야’ were raised, creating yet another successful fan project. Moving on to “I Like It”, it was like a mass karaoke session as fans sang along. It was also memorable because the BTS members specifically requested for the music to be softer so that they could hear the fans singing along with them. It was no doubt a sweet gesture by the group to subtly acknowledge the efforts of their fans. “If I Ruled The World” and “Cypher Pt. 3: KILLER” brought the concert to an all-time high, transforming the venue instantaneously to a big party ground. J-Hope commented that he felt a little sad that the concert was ending soon as he honestly thought that a mere five minutes had passed. Rap Monster added that even though the concert was ending soon, he hoped that A.R.M.Ys would enjoy till the end. Back on stage as seven with “Hormone War” and “Danger”, the fanchants were undeniably loud and powerful, just like the performance on stage. Rap Monster said that he would never forget the love and support given to them and was thankful for the opportunity to perform in Singapore. V expressed his reluctance to end this concert and told the fans to wait till they come back to Singapore again, after saying that he would definitely miss them when he heads back to Korea. The group really gave their all as they performed “Boy In Luv” amidst the cheers of A.R.M.Ys. Footages of BTS, which showed their growth from audition to their debut stage, late night dance practices, first fanmeet and fansign and finally their first concert, were being shown before the group appeared for their encore stage. Starting with “Path”, BTS made a heartfelt confession that if they were to walk, they will walk together with A.R.M.Ys, as though making an open promise to those who had supported them since debut. For the last talk segment, Rap Monster, on behalf of the group, thanked the fans for coming and spending the night with them. Jin added that the group would not be able to do this without the fans, thus he was really grateful. Suga commented that Singapore was the hottest place BTS had their concert at, due to the passion and energy by those who attended the concert. BTS even promised that they would come back really soon and hoped that the next time they are here, those who attended this concert will be there as well. While everyone was busy saying thanks, V just had to comment that he tried chili crab the night before and really liked the local delight. The award for the most random speech had to go to Rap Monster when he said “The Singapore I know is a really beautiful garden city. Singapore is really small but the GDP is very high!”, creating immediate bouts of laughter. BTS indeed saved the best for the last as they performed “JUMP!”, “Rise of Bangtan” and ended with “Satoori Rap”. It seemed as though it was a major party as their dancers joined them on stage. When the song ended, BTS reluctantly left the stage after shooting hearts, throwing their towels and caps and blowing kisses to the audience. Shouting endless “I love you Singapore” and promises of being back real soon, the whole concert ended with a video of BTS preparing for The Red Bullet concert. BTS no doubt left a strong impression with their powerful dance live stages and synchronized choreographies. We hope to see the group back in Singapore real soon. A big thank you to Three Angles Production for extending the event invite. (x)clusive is also proud to be the Supporting Online Media for BTS 2014 Live Trilogy Episode II: The Red Bullet in Singapore. 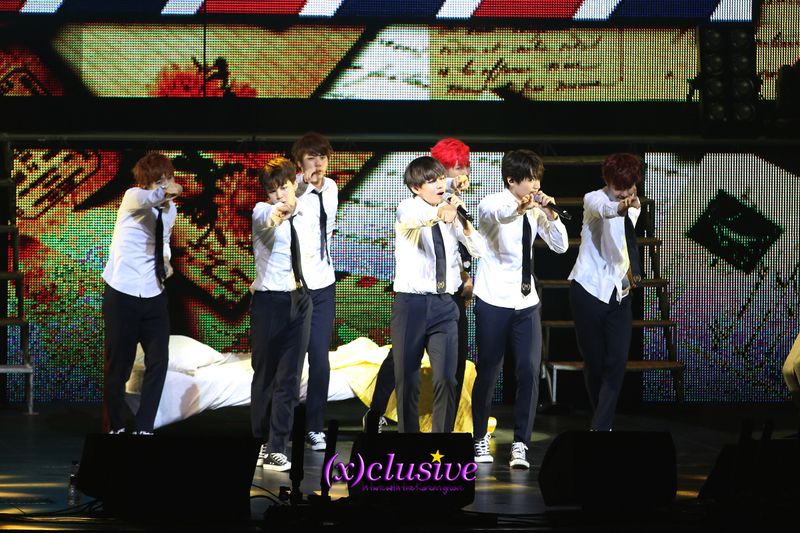 For more photos on The Red Bullet in Singapore, please head over to (x)clusive’s Facebook.